An original letter of correspondence between brothers and business partners Joshua Coffin Chase and Sydney Octavius Chase. Topics discussed in the letter include the size, maturity, and quality of Isleworth grapefruit in comparison to grapefruit being shipped by the Manatee Fruit Company; the consumption of juice; and the inability of the authorities to end the Manatee Fruit Company's shipments. 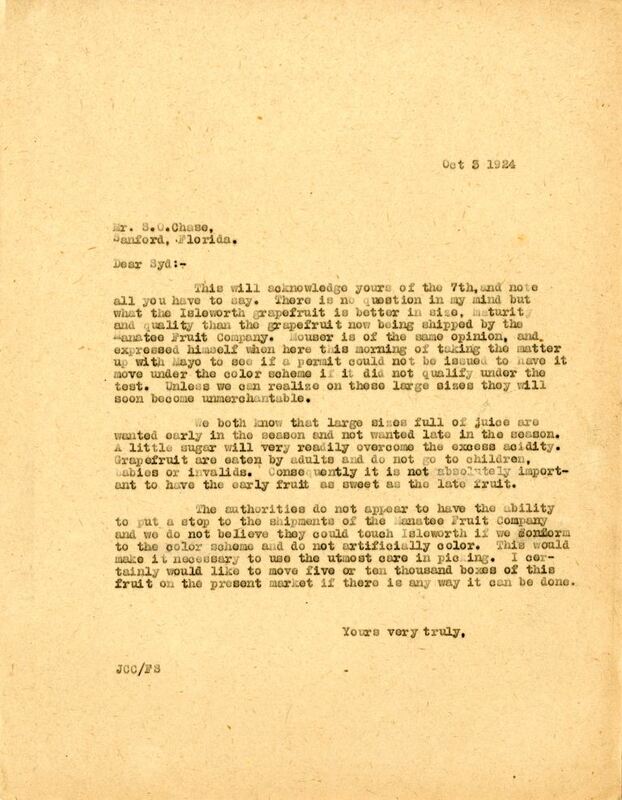 Original letter from Joshua Coffin Chase to Sydney Octavius Chase, October 3, 1924: box 49, folder 20.84, Chase Collection (MS 14), Special and Area Studies Collections, George A. Smathers Libraries, University of Florida, Gainesville, Florida. 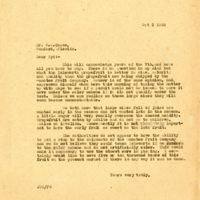 Digital reproduction of original letter from Joshua Coffin Chase to Sydney Octavius Chase, October 3, 1924. This will acknowledge yours of the 7th, and note all you have to say. There is no question in my mind but what the Isleworth grapefruit is better in size, maturity and quality than the grapefruit now being shipped by the Manatee Fruit Company. Mouser is of the same opinion, and expressed himself when here this morning of taking the matter up with Mayo to see if a permit could not be issued to have it move under the color scheme if it did not qualify under the color scheme if it did not qualify under the test. Unless we can realize on these large sizes they will soon become unmerchantable. We both know that large sizes full of juice are wanted early in the season and not wanted late in the season. A little sugar will very readily overcome the excess acidity. Grapefruit are eaten by adults and do not go to children, babies or invalids. Consequently it is not absolutely important to have the early fruit as sweet as the late fruit. The authorities do not appear to have the ability to put a stop to the shipments of the Manatee Fruit Company and we do not believe they could touch Isleworth if we conform to the color scheme and do not artificially color. This would make it necessary to use the utmost care in picking. I certainly would like to move five or ten thousand boxes of this fruit on the present market if there is any way it can be done. Chase, Joshua Coffin. “Letter from Joshua Coffin Chase to Sydney Octavius Chase (October 3, 1924).” RICHES of Central Florida accessed April 26, 2019, https://richesmi.cah.ucf.edu/omeka/items/show/2740.